Fruit; large, roundish, somewhat flattened. Skin; covered with rough brown russet on a yellowish-green ground colour, brownish next the sun. Flesh; greenish-yellow, tender, crisp, brisk, juicy, sugary. [HP]. Described and figured in the Pomological Magazine. ‘The French synonym of this valuable variety is, no doubt, accurate; and it is not improbable that the Passe pomme de Canada of the same nation is another name. Trees from the French Royal Gardens have proved so; and the only doubt upon the subject is caused by the name Passe, which usually designates fruit that passes away sooner than that with which it is compared.’ [PM t.125/1830]. Mentioned as early as 1597, and possibly Shakespeare’s ‘Leather coat’ in King Henry IV. Produces a large vigorous tree and a free bearer. ‘A most excellent culinary apple of the first quality. Ripe November to May, although it is apt to shrink and become dry on storage. [HP]. 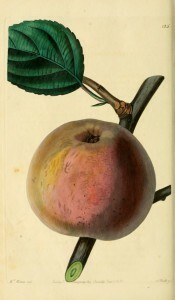 Listed as ‘Royal Russet, apple no.63’ in a hand written list of apples in an 1850 catalogue held at Camden Park [CPA]. Most of the plants hand-written in this catalogue subsequently appeared in the 1857 catalogue. That the apples did not is probably an oversight.